I had the fortune in participating in the Find the Future event, which was part of the on-going Celebrating 100 Years exhibition and series of events marking the century-old Main Branch of the New York Public Library. I spent 12 hours locked up in the Stephen A. Schwarzman Building with Robert. We were playing a game which involved finding objects labelled with QR code, more on that later. The best discovery of the night was located in the exhibit of artifacts from the library’s research collection. 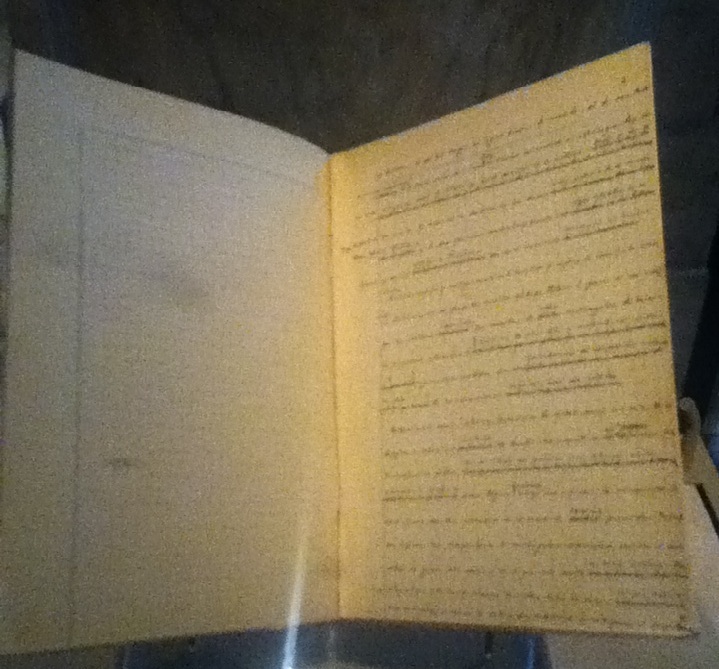 This crappy photo, taken without flash on a iPod touch, is a manuscript by Jorge Luis Borges, which was written on graph paper. Without overly romanticizing his process, graph paper is supremely fitting for an author who wrote literary works about the finite library (The Garden of Forking Paths, 1941), interactive fiction (The Library of Babel, 1941), and the limits of science and data collection, (On Exactitude in Science, 1946). This entry was posted in book, computation, design, gaming, information. Bookmark the permalink.